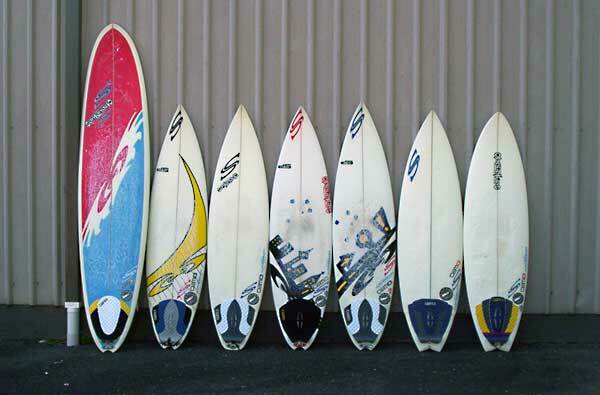 Designing your perfect quiver of custom surfboards requires a good look into every aspect of each design. Since surfboard glassing is so important to the overall look and structure of your new board, understanding surfboard resin is key. Surfboard resin, along with surfboard fiberglass, is one of the main ingredients in the glassing stage of a board. Resin is mixed with a catalyst, which causes the chemical reaction from liquid to solid to occur, and is then applied to the fiberglass cloth, ultimately attaching the cloth to the surfboard blank. The resin and fiberglass cloth combination is what waterproofs and gives strength to the surfboard. Here is a little insight to the main types of resin that are used on regular and custom surfboards today. Laminating Resin (Sylmar 249A): This is the first surfboard resin that is put onto the blank. It is a polyester resin and its main function is to attach the fiberglass cloth to the blank itself. The laminating resin sets with a somewhat tacky finish that is designed to help adhere the next layer of resin that is applied to the surfboard. Sanding Resin (Sylmar 250): This is also a polyester surfboard resin that is applied as a second coat in the surfboard glassing process. It is basically the same as the laminating resin, but with a sanding agent that is mixed into it causing it to cure harder and allowing you to sand the surfboard smooth. Gloss Resin: This surfboard resin is the last coat that can be applied to any or all of your custom surfboards seeing as it is completely optional. This is also a polyester resin and its main function is to give your surfboard a shiny/gloss finish. Other than adding to the cosmetic look, it has little use seeing as the two previous resins take care of strengthening and waterproofing the surfboard. Resin Research Epoxy: Developed by Greg Loehr, this epoxy resin seems to have a lot more pros than cons. Besides being super easy to work with it also dries a lot harder than polyester surfboard resin (harder resin means stronger boards). It has also been developed to function not only on EPS surfboard foam, but polyurethane blanks as well. These different resins are constantly improving and people are always trying to develop stronger and more efficient ways to better the surfboard glassing process. A great example of the many breakthroughs in resin technology is the UV catalyst that has become popular in the last few years. This particular resin hardens when it is exposed to UV rays found in the sun. This means you can get you glassing done perfect in the shade then put it outside to dry, avoiding the rush of finishing before the resin hardens on you. What will they come up with next?